It is well documented that most hydrocarbon accumulations have escapes or microseepage that are predominantly vertical, as well as that they can be detected and mapped using various non-conventional and non-seismic exploration methods. The surface expression of hydrocarbon microseepage can take a variety of forms, which determine the development of several detection methods, both direct (hydrocarbon gas geochemistry) and indirect (Redox Complex), as well as non-seismic geophysical methods (gravimetry, magnetics, electrics, and airborne gamma spectrometry), morphometry, and remote sensing. Benefits in the use of non-seismic and non-conventional exploration methods, integrated with geological data and seismic, result in a better evaluation of prospects and exploration risk. The source materials are as follows: the gravimetric (Bouguer reduction 2.3 t/m3) and aeromagnetic (reduced to pole) maps at a scale of 1:50,000; airborne gamma-spectrometric maps (channels K, Th and U (Ra)) at a scale 1:100,000; the Digital Elevation Model (90 × 90 m) and; digital maps of hydrocarbon shows and oil wells of the Republic of Cuba at a scale of 1:250,000. The processing consisted in the regional-residual separation of the gravimetric and morphometric fields, the calculation of the first vertical derivative of the gravimetric and aeromagnetic fields and of the K/Th ratio. 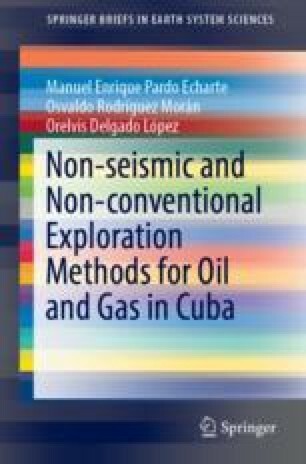 A mapping of sectors of oil–gas interest in western and central Cuba related to the conventional oil of the Placetas Tectonic-Stratigraphic Unit and the Jurassic level is based on the presence of a complex of indicator anomalies. It considers the following attributes: subtle local gravimetric maximums (in or near regional minimums); minimum of the K/Th ratio and local maximums of U (Ra) at its periphery, and; local maximums of residual relief.